I’m on my flight from Barcelona (goodbye sunshine) to Zürich decompressing from from all the announcements, tech talks and new connections made during the last 2 days. DockerCon EU delivered on everything they promised. I was finally able to talk to people in person that I’ve been following on Twitter or slack page for ages. The demos during the keynotes were awesome to say the least. They were packed full of "live" demos which is always good. It was kinda of a running joke during the Security demo as the WIFI was cutting out and the presenters without skipping a beat switched to video and kept flowing with as if it was live joking about "live demo" the entire time. Classic and well played. Yubico hardware encryption key which is a hardware USB key used for signing images. State of the art stuff and a small Oprah moment by Salomon as everyone had a key taped under their chairs. Scaling! 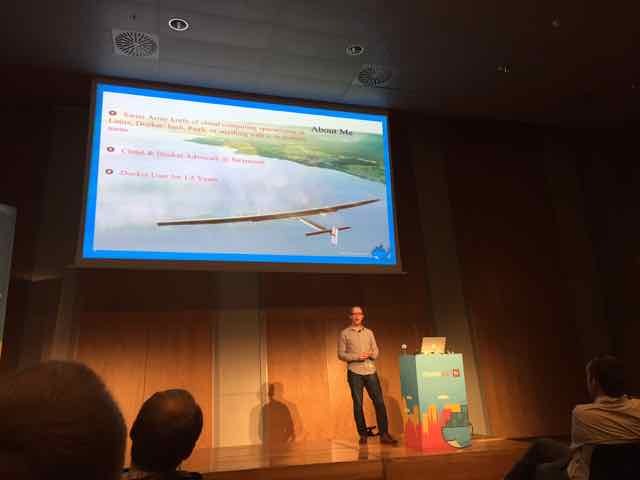 Wow they did a live demo of scaling Docker Swarm to 1,000 hosts running 50,000 containers. When an additional container was launched it took under .3 seconds. Impressive. However in our environment this is way larger than we can ever imagine. In other words, every Keynote demo was impressive. I think I managed to visit every vendor booth at least twice during my 2 days. I had some really interesting talks with basically all the vendors. 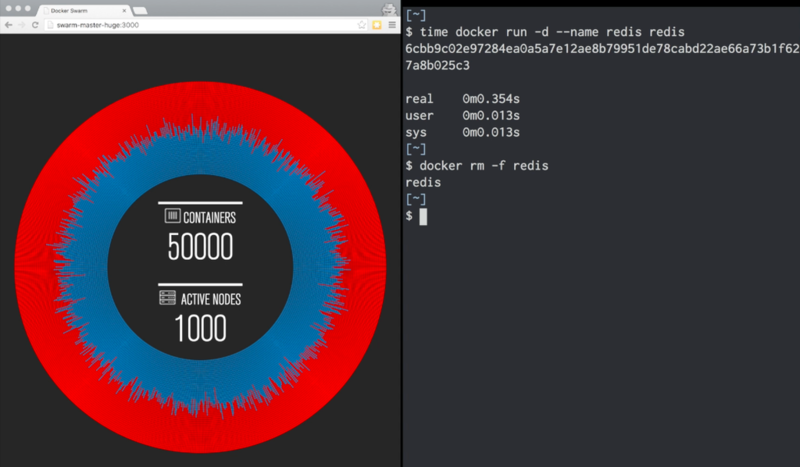 It was great talking to Red Hat as they gave me some incredible container insight. Ruxit and Sysdig in my book have the best monitoring solutions on the market at the moment. Sysdig informed me of their open source monitoring tool which has now been firmly added to my ToDo list. The Rancher guys were incredibly busy with demos as their product was really hot. I cannot wait to see the GA release next year. The Tutum guys also provided a lot of insight into what's in the pipeline for Docker and to get ready for the Unikernel. The big takeaway from the tech talks is everyone has made containers part of their main strategy from Microsoft to IBM. I was quite impressed with the level of commitment from Microsoft and their container strategy. That's saying a lot coming from me. Having Microsoft developers onboard will only drive the Docker ecosystem further. The venue for the party was incredible! 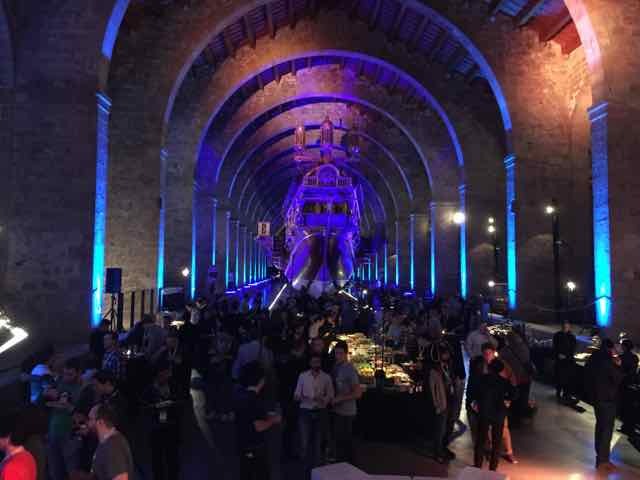 Docker held the party at the Barcelona Maritime Museum. The traveling exhibit was of course containers which was really cool to see the history of shipping containers. But the museum itself was huge and the illumination of the old ship building produced an aurora of light around all displays and the giant Spanish ship in the middle making it spooky and cool at the same time. Considering all the conferences I’ve attended across a spectrum of industries and locations this party venue tops my list. I bumped into the Docker Marketing troop and hung with them most of the evening. We discussed a huge range of topics from skiing to my 4 month old son. It was a great time and a really interesting group of people. As we were talking, they introduced me to Solomon Hykes as he was randomly passing by. Wow, the founder of Docker was a super nice guy, approachable and really interested in our feedback about the conference and the product. OK OK. I have to plug my Presentation as well. Considering that it was my first conference presentation I think it went well. The demo gods were in my favor, thankfully. From the stage it appeared to be thousands but in reality probably around 150 people. I had quite a lot of questions and feedback which I take as a good sign. I also believe my Chocolate versus Nobel Prize winners correlation slide was the favorite amongst the audience also the fact I announced I was giving some Swiss chocolate away to the audience. Wow what an amazing conference! This was my first DockerCon but I will ensure it will not be my last. From the tech sessions to the networking it was all well worth the trip. Oh, and I won a Dell laptop by chance as well.